Noboru Kimura - Seven Countries Study | The first study to relate diet with cardiovascular disease. Noboru Kimura (1911 – 1983) was one of the first clinical scientists anywhere to highlight the rarity of coronary disease and frequency of hemorrhagic stroke in Japan and to pose hypotheses about their causes. He was also one of the first clinicians to look beyond the clinic to the general population for the causes and prevention of common cardiovascular diseases. Kimura graduated in medicine in 1936 at Kyushu University. After that he launched his career by becoming resident at Kyushu hospital, where he would stay until he was inaugurated as professor in 1945. He sought out Ancel Keys in the early 1950s to encourage him to come with Paul White to Japan and make both internal and external comparisons of cardiovascular disease rates. He also came to the Laboratory of Physiological Hygiene in 1952, at the very time that Ancel Keys was beginning to formulate ideas about the importance of lifestyle in population disease differences. At the World Congress of Cardiology in Washington in 1954 and at the WHO Expert Committee Meeting in Geneva in 1955, the discussions between Kimura and Keys about collaboration continued. Both recognized that Japan held a key to understanding the mechanisms of mass atherosclerosis. Kimura consequently became principal investigator for all Japanese Seven Countries activities. 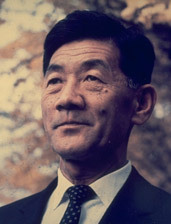 In 1976 Kimura received the Japanese Medical Association Award. The Kimura Memorial Heart Foundation supported generously the reunion of the Seven Countries Study principal investigators held in Fukuoka, Japan in 1993.